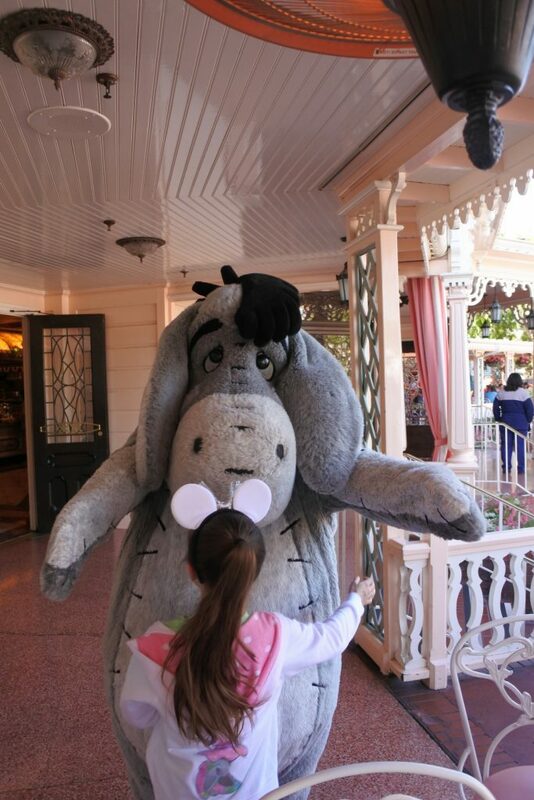 We love meeting Disney characters and Disneyland has wonderful character interactions. One of our favorite ways to meet several characters at once is with a character meal. 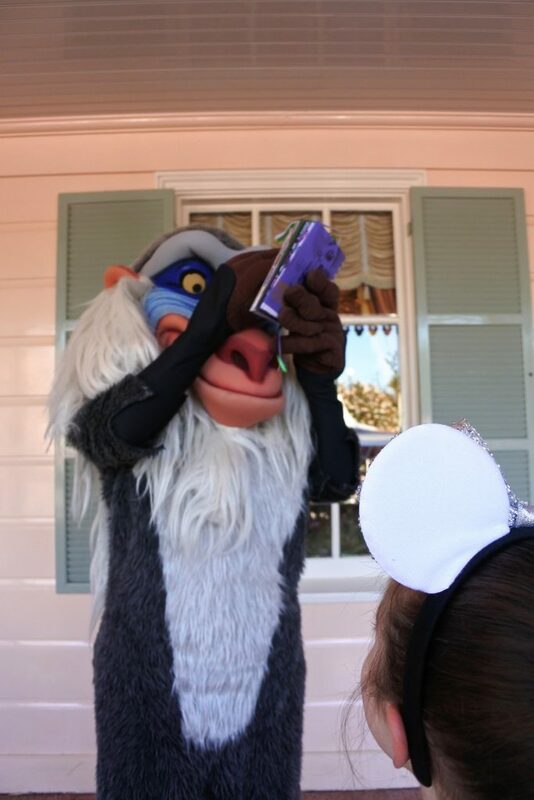 In particular, there is one character dining option at Disneyland that provides especially fun character interactions. This fabulous character meal is Minnie and Friends breakfast in the park at Plaza Inn. Minnie and Friends Breakfast in the Park at Plaza Inn is different than any character dining we have ever done in the past. 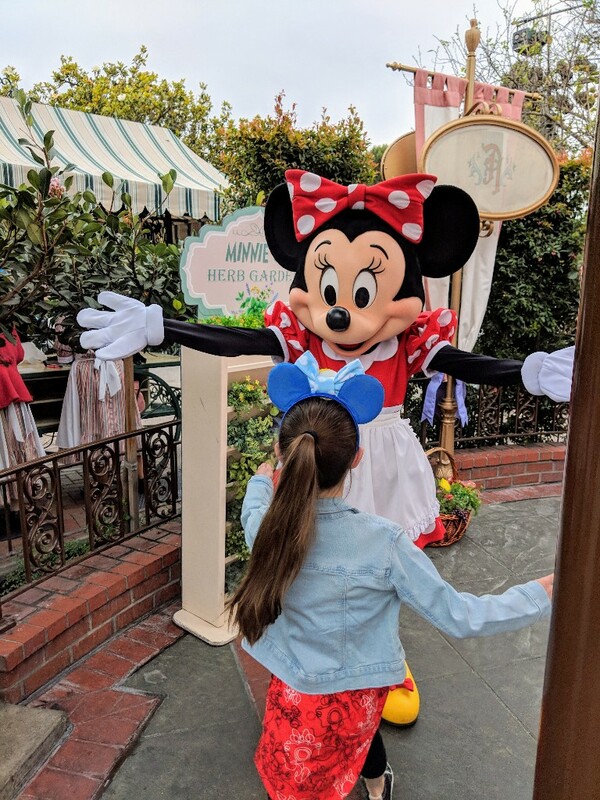 At this character meal you can meet Minnie, but other than that it is a hodgepodge of characters which we think is amazing. 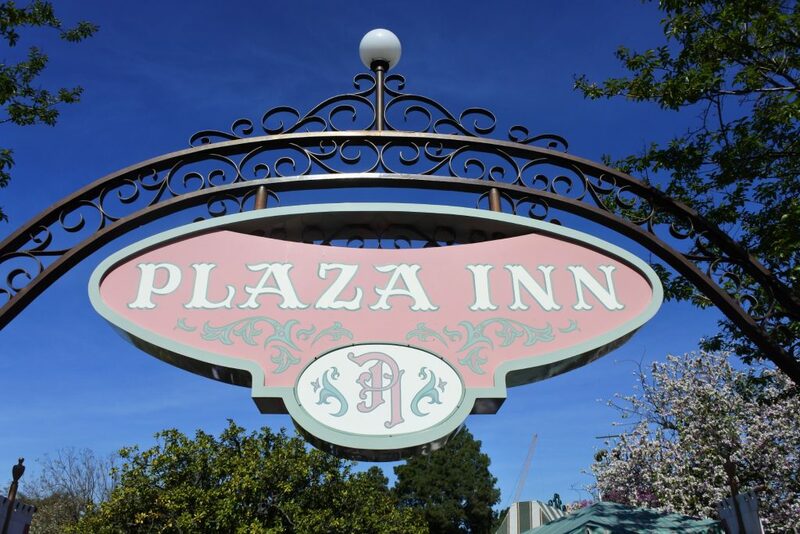 Plaza Inn is located inside Disneyland Park just off of Main Street near Tomorrowland. There are indoor, outdoor porch, and patio tables. The patio has a mix of tables most of which seemed to have umbrellas. We have been seated at both the covered porch and indoor tables. Characters are only at Plaza Inn during the Minnie and Friends Breakfast in the Park. Advanced dining reservations for breakfast with Minnie can be made 60 days prior to your planned day at the parks. If you would like to dine there for lunch or dinner, it is a quick-service restaurant with no characters or reservations required. As with any Disneyland character meal getting a perfect picture can be a challenge at Plaza Inn Breakfast with Minnie and Friends. However, choosing the right seat for the character fans goes a long way in improving your photos. I find it best to position Elizabeth across from me at the table and have her in a chair that has open space around it. This way she can get up to give hugs and pose with the characters while I get some photos. If your phone has a portrait mode (like my Pixel 2) use it. Portrait mode will soften the unintentional background images and keep your character interaction the focus of the picture. The Minnie and Friends breakfast is served as a buffet with several different stations. There is a little bit of everything available: country fried steak, biscuits and gravy, made to order eggs and omelettes, hash browns, bacon, sausage, fresh fruit, cereal, french toast, and Mickey waffles. There is milk, juice, coffee and tea to choose from for drinks. 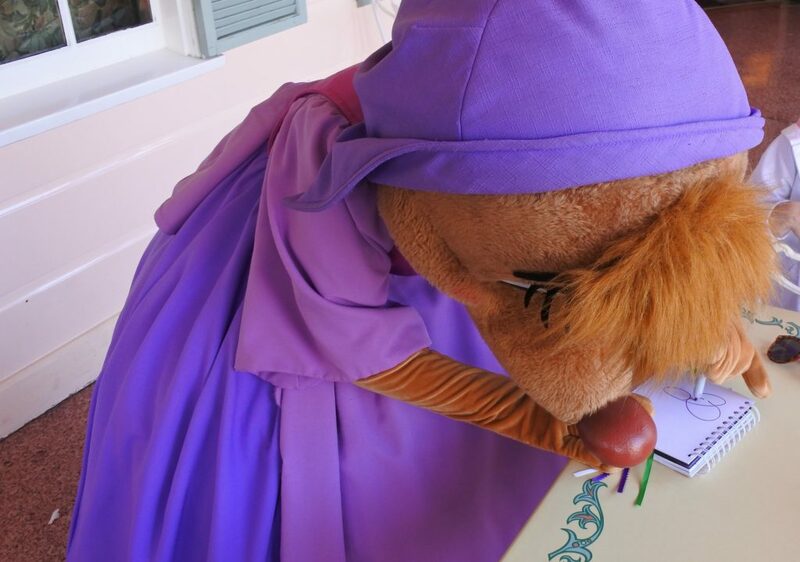 Pro tip: We always take turns obtaining our breakfast at a character meal buffet. The reason we take turns is you never know who might arrive at your table at any moment. Going in shifts allows Elizabeth and another adult in our group to always be ready to meet a character and get some photos. Buffets make me nervous with Elizabeth’s food allergy (read more about food allergies at Disney parks), but the chef comes out to consult with us after we are seated. After discussing the available options the chef usually goes to the kitchen to make a special allergy-safe plate of food for Elizabeth. 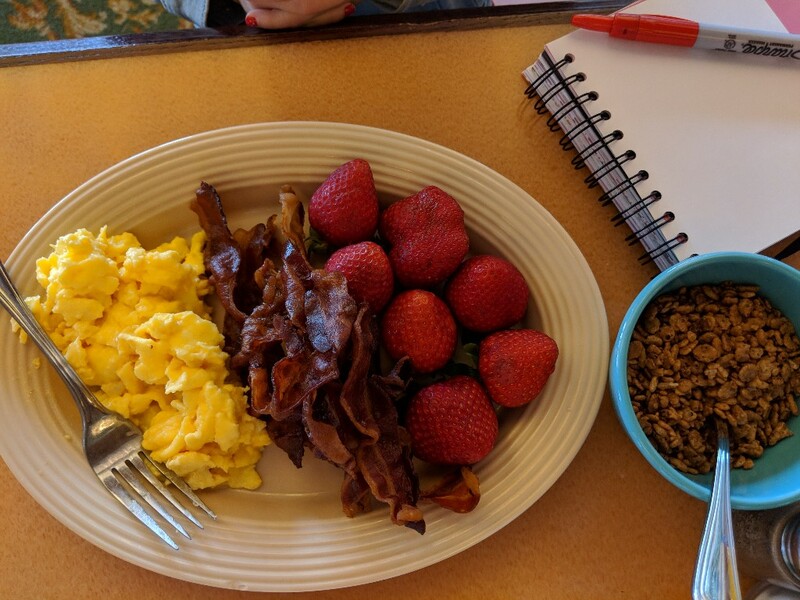 At most Disney breakfast buffets she can usually eat her fill of eggs, bacon, and fruit. Sometimes I also bring a little corn-free cereal to round out her meal. Minnie and Friends Breakfast in the Park at Plaza Inn gives the opportunity to meet many classic and other less common Disney characters. 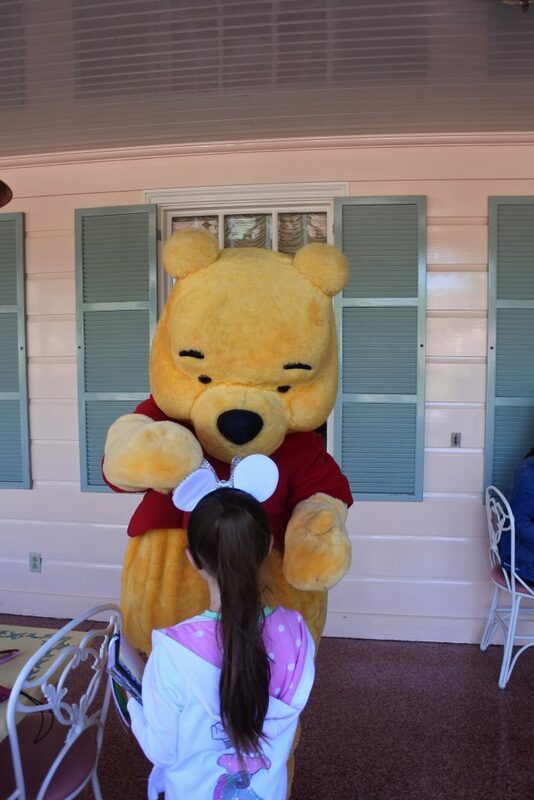 We have generally met around 10 characters at our Plaza Inn breakfasts. Please note: Availability of certain characters and the number of characters is not guaranteed. It is reasonable to expect the host Minnie Mouse to welcome you, but everyone else will vary. 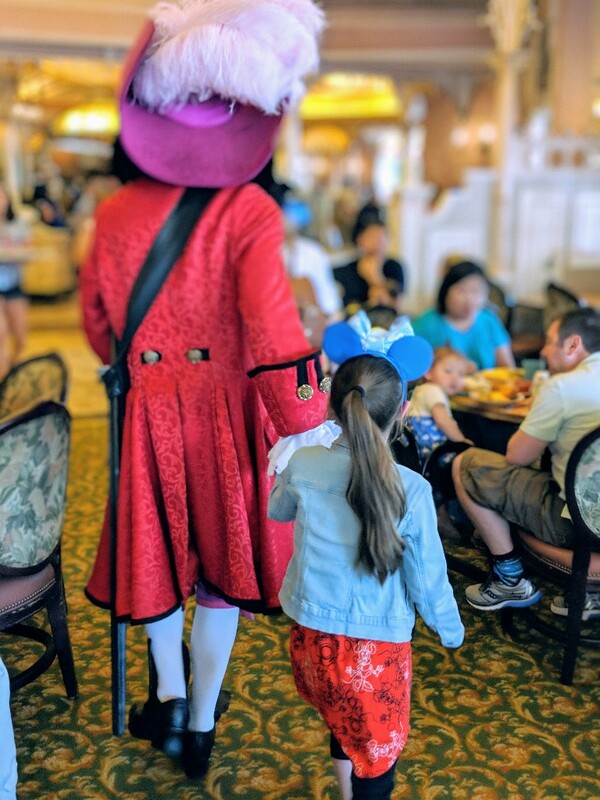 After checking in and paying for your meal at Minnie and Friends Breakfast in the Park at Plaza Inn, a cast member will lead you to an area to meet Minnie Mouse. After meeting with Minnie this same cast member will lead you to your table. There are a handful of characters that we have seen multiple times at Minnie and Friends character breakfast. For example, we have seen Rafiki, Eeyore, Winnie-the-Pooh, Tigger, Chip, and Fairy Godmother more than once. Other characters have been more rare. For example, we have only seen Perla, Max (Goofy’s son), and Pinocchio once. Below are some of the characters we’ve interacted with at Plaza Inn breakfast with Minnie and Friends and examples of our interactions. A trusted shaman of the pride lands. You might recognize Rafiki from when he presents Simba as a cub to all the animals in The Lion King. One of Cinderella’s mouse friends and a rare character sighting. This friend of Winnie-the-Pooh’s is less downer and more adorable than I had expected. He is very shy, but sweet when interacting with us. This classic character is also very friendly and sometimes kind of silly. 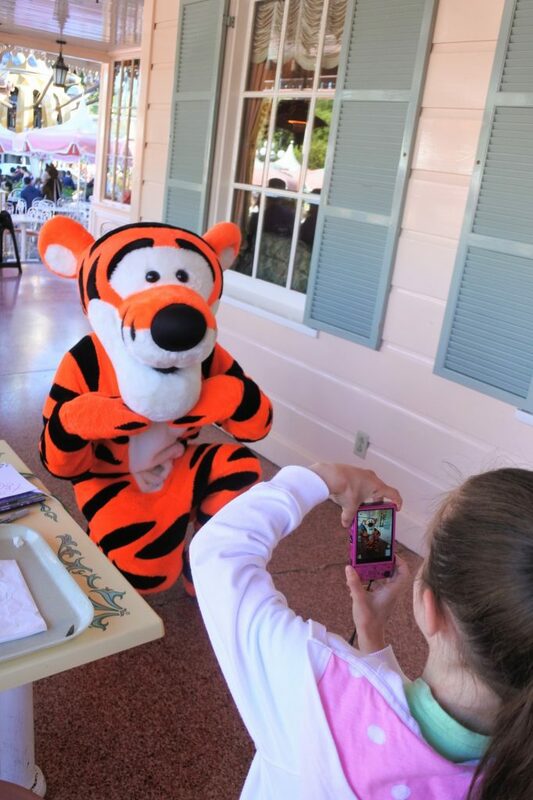 Tigger never disappoints with his exuberance! Dale is quite silly and is always up to something. 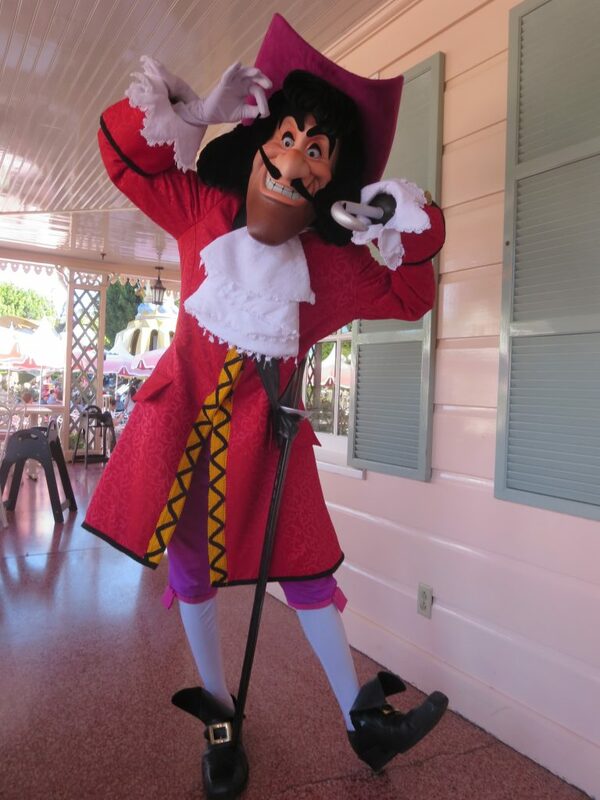 Hook is my personal favorite at our breakfasts. We’ve had two special interactions in particular. The first one occurred when Elizabeth was wearing my super sparkly silver ears. A pirate through and through, Hook took the ears to examine their worth. He even tried them on, but eventually returned them. Another time Hook admired my new Luxo Ball ears and then quickly grabbed them! He refused to return the ears unless we traded for Elizabeth’s autograph book. Elizabeth pretended to trade and then stole my ears back. Hook was so impressed by her deviousness that he offered her a spot on the Jolly Roger. Fairy Godmother is so kind to Elizabeth. At one of our breakfasts Fairy Godmother sweetly held Elizabeth’s face in her hands and told her how much she loved her freckles. Fairy Godmother told Elizabeth that she was fortunate to be blessed with so many fairy kisses (freckles) because that meant she is a special girl. 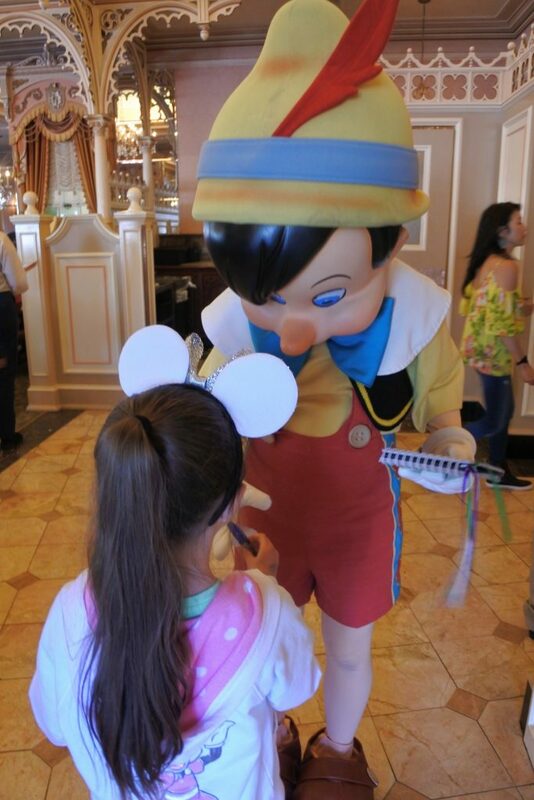 One of the Plaza Inn breakfasts had Pinocchio in attendance. I really wanted to meet Pinocchio. I had never seen a meeting opportunity with him before at Disney World or Disneyland. Unfortunately, Pinocchio never made his way outside, but I spied him while getting my food. At the very end of our meal I finally asked a cast member if Pinocchio would be out to meet us. He was not scheduled to come outside, but the cast member allowed us to come inside to meet Pinocchio. Although not the most ideal meeting location I truly appreciated the cast member helping us! Of all the character meals we have done over the years Minnie and Friends Breakfast in the Park is definitely one of our favorites. 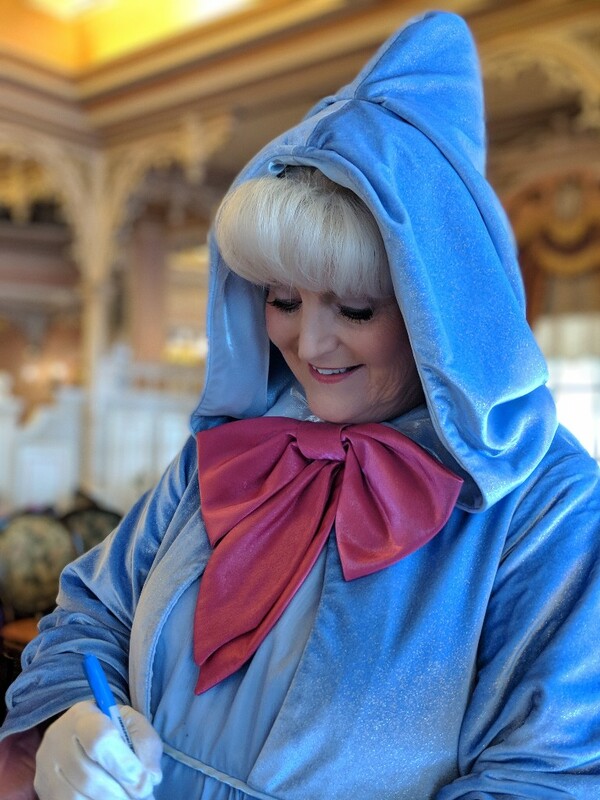 You don’t necessarily know who you will meet during your Plaza Inn breakfast other than Minnie, but every interaction we have had was very good. In fact, Plaza Inn breakfast has the highest number of characters we have ever met at a meal. Seeing around 10 characters at this meal smashes our previous records of 5 princesses at Cinderella’s Royal Table and Akershus in Disney World or 6 characters at Goofy’s Kitchen in Disneyland. The Plaza Inn breakfast provides a great value since we usually see around 10 characters in about 90 minutes while eating our fill. The price (as of June 2018) is $34 per adult and $19 per child for the all you can eat breakfast. The Plaza Inn breakfast isn’t a gourmet meal, but is certainly okay and quite filling. 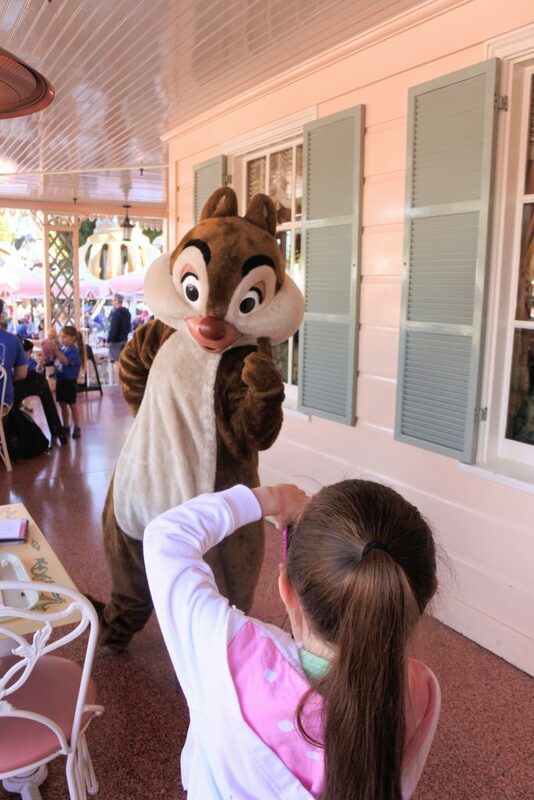 As we’ve come to expect, the character interactions are amazing at Plaza Inn breakfast. Everyone is very kind and some really go above and beyond (I’m talking to you, Hook). In fact, at one of our breakfasts Elizabeth asked each character if they would pose solo so she could take her own picture. Everyone she asked happily posed. And again Hook killed it by twisting his mustache after looking in the window glass to make sure he looked good. If you want an inexpensive option to meet a lot of characters in a short time frame this Disneyland character meal is absolutely for you. I only wish Disney World had something as amazing! Disneyland Plaza Inn Minnie and friends breakfast is one of the best character meals I have ever done. 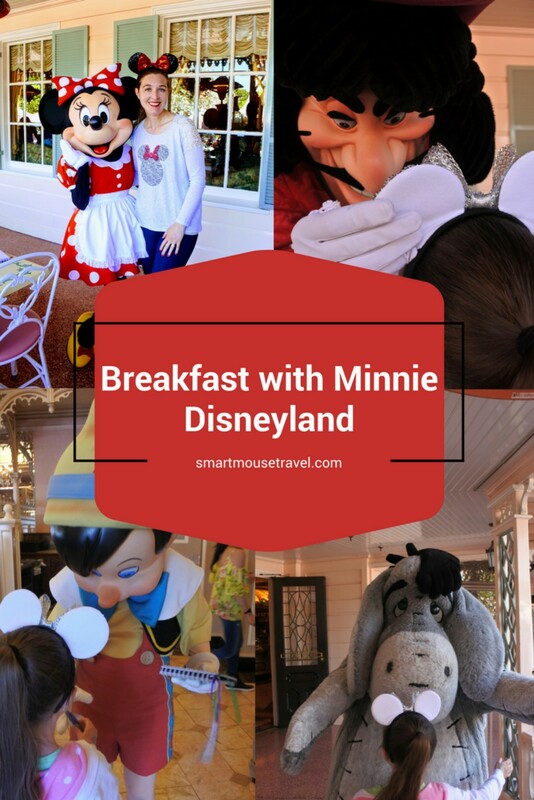 If you are looking for a unique character meal at Disneyland I highly recommend Plaza Inn breakfast with Minnie and friends. 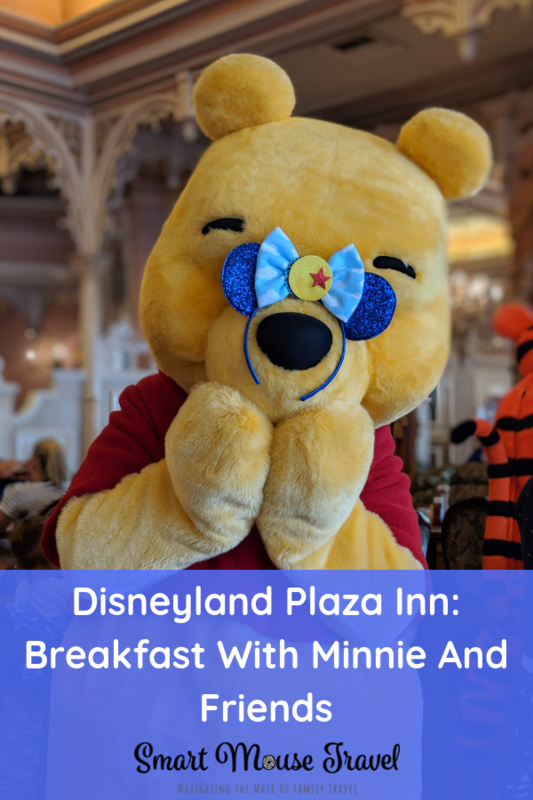 If you are ready to make your reservation or find out more about Plaza Inn breakfast with Minnie head over to the Disneyland website. I love character dining and WDW and pinned this for an upcoming Disney land trip. I do love that they take care of the allergies, that is great to hear! Oh my!!! I love that this is a mix of all different characters. Some of those are really hard to find at WDW. I can’t wait to go to Disneyland! I haven’t done this character dining experience yet. Looks fun.